A cultural staple in the Toledo area since 1869. Please join us on Wednesday evenings at 7:30 at Oak Shade Grove. to watch over the tournament to make sure it runs smoothly and the winner gets his or her money. Nothing could go wrong, right? 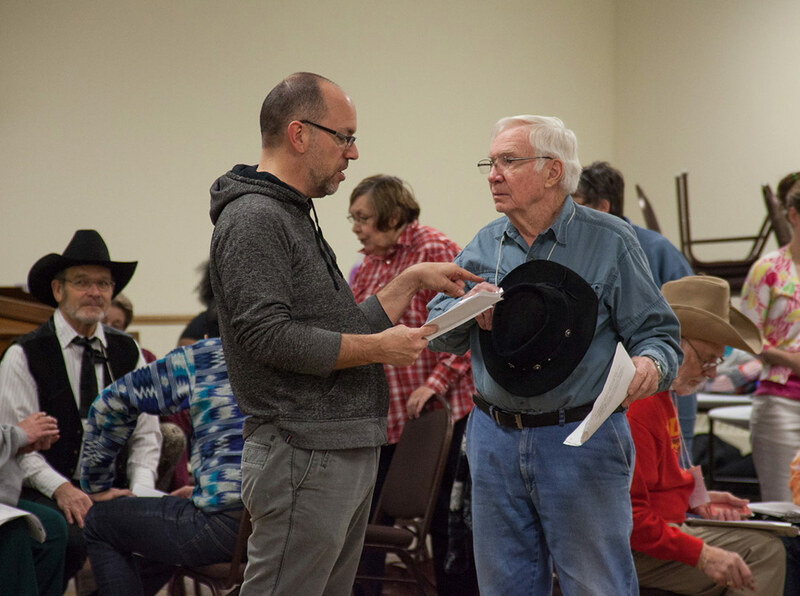 Rehearsal photo by Jennifer Kahler. The Toledo Swiss Singers, one of the area’s oldest singing groups, will be asking the question, “WHO DUNNIT?” at their second annual dinner-theatre mystery event, held for two nights, Feb. 20 and 21. The evening, titled “Murder! 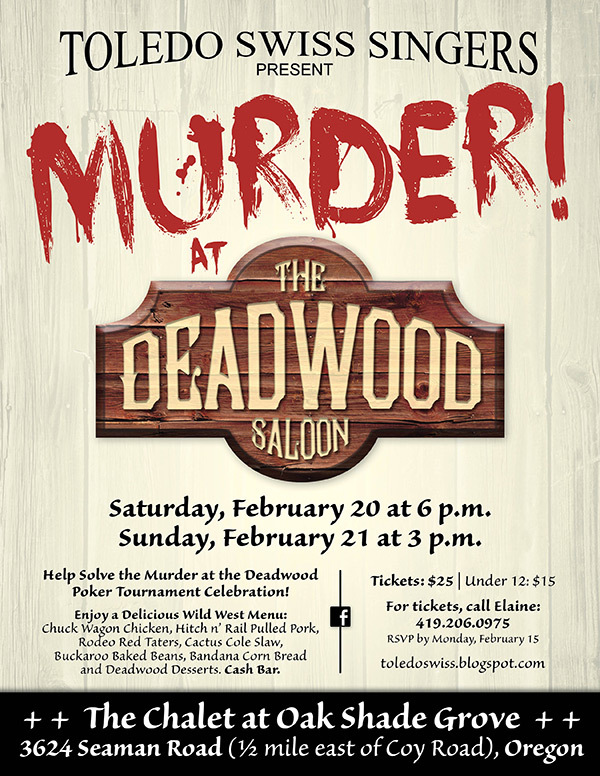 at the Deadwood Saloon,” will feature a murder at the Deadwood Poker Tournament Celebration — at The Chalet at Oak Shade Grove, 3624 Seaman Road in Oregon. Members of the audiences will enjoy watching as all of the characters attend the tournament in its final night of competition. During the evening there will be a mysterious cold-blooded killer on the loose. Who is the victim? When does it happen? Which character is responsible? Written and directed by Swiss Singer Jane Williams, “Murder! 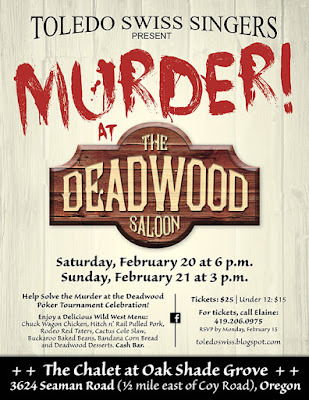 at the Deadwood Saloon” will have audience members using evidence provided and making keen observations to carefully conduct their own investigations. Gather the clues and determine who could be the killer! Those in attendance are asked to join in the fun and wear their best Western attire. The evening will include a delicious Wild West menu: Chuck Wagon Chicken, Hitch n’ Rail Pulled Pork, Rodeo Red Taters, Cactus Cole Slaw, Buckaroo Baked Beans, Bandana Corn Bread, Deadwood Desserts, a cash bar and, of course, the murder mystery. Doors open at 6 p.m. on Saturday, Feb. 20 and 3 p.m. on Sunday, Feb. 21, with the theatre presentation beginning promptly at 6:45 p.m. and 3:45 p.m., respectively. Dinner will be served during the performance. Tickets are $25.00, with $15.00 tickets for children 12 and under. Reserve seats by Feb. 15 by calling Elaine at (419) 206-0975. Find the event on Facebook and share with your friends! Currently under the direction of Micah Graber, the choir has been a cultural staple in the Toledo area since 1869 — that’s 146 years of celebrating Swiss culture in the area. The chorus in its current form has been around since 1924. Its aim is to retain and preserve the culture and songs of Switzerland, to live up to the singers’ ancestors’ tenets of faith and behavior, help others, and to be good citizens. The Singers usually perform three concerts annually, including a wide variety of traditional Swiss, Broadway, Gospel and American music. The nonprofit organization is also part of the larger German American Festival (GAF) Society, which most people associate with the festival held annually in August. The society consists of seven German-speaking societies. During the festival, the Singers set up and operate the Swiss Cheese Haus, along with the Stein Stossen contest. The GAF Festival draws more than 30,000 people on an average weekend and is the largest ethnic festival in this part of the country. They are also are part of North American Swiss Singing Alliance (NASSA), made up of 14 choirs from Canada and the U.S. The Singers compete internationally every three years; the most recent competition was held in June 2015 in New Glarus, Wis., where the group was awarded gold and silver prizes. The next competition will be held in June 2018 in Toledo. The Swiss Singers practice Wednesday evenings at 7:30 at Oak Shade Grove from September to May.